The Moto 360 may look elegant but the appeal of analog watches will never die. At least, not yet. In the meantime, that's why there are plenty of contraptions on the market to give your simple wrist-ware a little more technological oomph. Must read: What comes after the smartphone? There are also people out there who don't need the pizazz of a Samsung Gear S2 or Apple Watch - simpler can be better - if it's done right. You may be wondering why analog lovers would even consider adding on tech in the first place. If a small module or chip can be incorporated to turn a plain watch into something meaningful personally and technologically, why not? There's the bonus perk of tracking activities all without the need of purchasing an extra fitness tracker or expensive smartwatch that will take up wrist real estate. It sounds like affixing a piece of tech would detract from the importance of say, a beloved heirloom, but remember: it's all removable and discrete. At least that's what a good version of smart tech should be when supplementing dumb devices. We've seen enough gadgets that have good intentions but don't quite hit the mark, while others genuinely have been made smarter. Here's a few examples below. What if you had a device that could turn any watch into a smartwatch? That seems to be the premise behind Chronos, a little disc-shaped module that brings the benefits of wearable tech to plain 'ol dumb watches. It's a stainless steel, connected module that's less than 3mm thick, 33m in diameter, and connects to the inside of 80% of watches out on the market, via micro suction tech, not magnets. The form factor is an important aspect of this add-on since it needs to sit squarely against your wrist and your watch. There's already such a small amount of space, anything larger would be ridiculous. 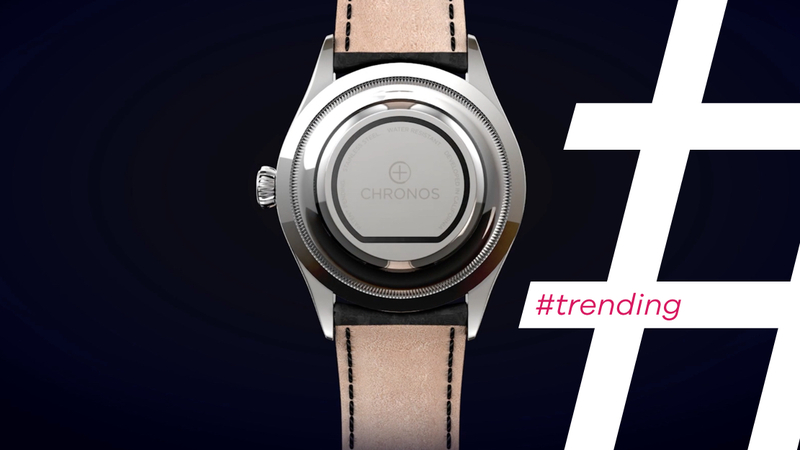 With Chronos on the back of a watch, you get alerts, activity tracking and gesture controls. It's along the line of designer watches that look analog but provide a slew of smart skills without a touchscreen face - oh and without you needing to buy the designer watch in the first place. Speaking of designer watches, Mondaine is a classic brand that's been around the wearable block awhile now. But it looks like the company will be adding on a new feature: embedding an NFC chip into the strap of its watches allowing smart payment technology. It's pretty reminiscent of Pebble's Smartstraps but Mondaine has partnered with Swiss bank Cembra, which means you'll need to apply for one of their credit cards to take advantage. Boo. It cannot be stressed enough how an age-old feature of analog watches - the rotating bezel - has made the Gear S2 one of the more exciting smartwatches to come out. So why not put a smart bezel on a dumb watch? While it sounds like a good idea in theory, it hasn't been executed well in practice. The INOX Cybertool from Acer and Swiss Army knife maker Victorinox isn't exactly what we'd want from a smart bezel. Remember the slim form factor we praised the Chronos for? It's definitely missing from the Cybertool device. Smartwatches are already too massive and companies have only recently begun trimming the excess with second and third-gen devices. The Cybertool apparently didn't see the memo because its a beast that can't be tamed. However, it's still early in the game and the Acer / Victorinox duo still have time to fix it.